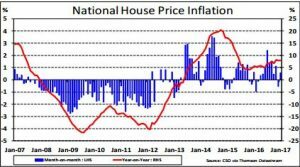 Irish reside ntial property prices slowed from an annual rate of growth of around 20% in the second half of 2015 to a 5-6% range in the first half of last year. This slowdown in price increases coincided with the introduction of new Central Bank regulations on mortgage lending. However in recent months, house price inflation has exhibited signs of reacceleration. CSO data for January showed house prices nationally registering year-on-year growth of close to 8%, similar to its December pace. This quickening in the pace of price increases has occurred against a backdrop of a relaxation in the aforementioned Central Bank regulations, as well as the Governments ‘help to buy’ scheme . In terms of the geographic breakdown of house price growth, non-Dublin prices continue to outpace increases in the Capital. Prices outside of Dublin recorded an 11.3% yearly rate of increase in January versus a 5.3% rate of growth in Dublin. However, despite the on-going recovery in house prices, they remain a long way o4 their previous highs. Both national and Dublin house prices are some 32% below their peak levels, reached back in 2007. In contrast, rents have gone above their previous peak, exceeding this level by 13% in February with a year-on-year increase of 8.5%. In response to the on-going price pressures in the rental market, the Government has expanded the number of locations (originally was just Dublin and Cork City) to come under the scope of the 4% annual cap on rent increases. However, while the combination of the relaxation in mortgage regulations and the ‘help to buy’ scheme may have contributed to increased upward pressure on prices, the underlying key issue remains the shortfall in supply. 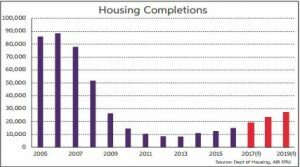 Figures from the Department of Housing showed that housing completions totalled 14,932 units in 2016. While this represents an increase of 18% compared to 2015 levels, it remains well short of the estimated 25,000-30,000 units that are required per annum to meet underlying demand. Other data on the housing market also reflect the low levels of housing supply. The latest Daft.ie figures show that at end-2016 the number of properties available for sale was down 14% compared to a year earlier. This level of sales stock represents less than 1% of total housing stock, whereas in a ‘normal’ market, the sales stock would account for around 3-4% of total stock. The mortgage market also continues to be impeded by the lack of su=cient supply, with the total value of drawdowns in 2016 equating to around €5.7bn, some way short of the projected €10bn for a functioning residential sector. A pick-up in supply will help mortgage lending experience further growth in the next few years. In this regard, leading indicators of supply suggest that building activity is on an upward trajectory, but overall supply remains at low levels. Both housing registrations, which tend to reflect developer activity, and commencements data continue to register strong growth. Meanwhile, survey data, such as the housing component of the construction PMI, indicate positive signs on future supply. Notwithstanding these encouraging signals, though, the supply decit, which has been a constant feature of the housing market in recent years, is likely to persist for some time. Based on current supply dynamics, it could be 2019 at the earliest before new house building is anywhere near the required level, not taking into account pent-up demand. Full details on the report can be viewed here.